Home → News → Press 2012 → Kennebunk High School Viedo "Point of No Return"
Maine’s Distilled Spirits Wholesalers Underwrite Effort to Educate Young Drivers on the Dangers of Impaired Driving. Contributions for “Point of No Return” presented to Secretary of State Charlie Summers. 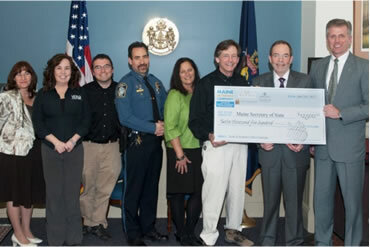 From left to right Johnnie Meehl from Maine Bureau of Alcoholic Beverages and Lottery Operations, Denise Dupuis from Video Creations, Lee Cote from Video Creations, Kennebunk Police Chief Robert MacKenzie , Sheryl Burns from Video Creations, L. Blake Baldwin from Video Creations, Maine Beverage Company President and CEO Dean Williams and Secretary Summers. AUGUSTA, Maine –Maine’s Spirits Industry presented Secretary of State Charlie Summers with contributions to purchase 500 copies of the video “Point of No Return” - a video with a powerful lesson for young people on the dangers of drinking and driving. During his “Conversations With the Communities”, Secretary Summers was approached by Kennebunk Police Chief, Robert MacKenzie and who invited the Secretary to view the film. “I was so profoundly affected by the message of ‘Point of No Return’ and impressed by the quality of the production, that I wanted to make sure every high school student across Maine has the opportunity to see this for themselves,” Summers said. “Point of No Return” was produced locally by Video Creations, a Kennebunk video production company after Chief MacKenzie approached them with his idea, and stars Kennebunk High School students. “The idea was to protect the kids in our community - in Kennebunk. We had no idea that it would turn out like this. They say it takes a village to raise a child, what we focused our time, energy and resources on was that it also takes a village to protect a child,” said Video Creations President, L. Blake Baldwin. ?Former Senator Danton played a key role in making this project a success.? I want to thank him and all the contributors who participated in making the wide-spread distribution of this video a reality,? Summers said.? Secretary Summers is presenting a copy of this video to each of the high schools he brings his message of Young Driver Safety Awareness to and is making it available, free of charge, to all high schools across Maine.? Additionally, because 8 of the 10 deadliest days for teen drivers occur between May and August, Secretary Summers is also encouraging schools to show this video to the entire student body in an effort to promote the dangers of Drinking and Driving during prom and graduation season. ?